PyTorch v TensorFlow – how many times have you seen this polarizing question pop up on social media? The rise of deep learning in recent times has been fuelled by the popularity of these frameworks. There are staunch supporters of both, but a clear winner has started to emerge in the last year. PyTorch was one of the most popular frameworks in 2018. It quickly became the preferred go-to deep learning framework among researchers in both academia and the industry. After using PyTorch for the last few weeks, I can confirm that it is highly flexible and an easy-to-use deep learning library. In this article, we will explore what PyTorch is all about. But our learning won’t stop with the theory – we will code through 4 different use cases and see how well PyTorch performs. Building deep learning models has never been this fun! Note: This article assumes that you have a basic understanding of deep learning concepts. If not, I recommend going through this article. Let’s understand what PyTorch is and why it has become so popular lately, before diving into it’s implementation. PyTorch is a Python based scientific computing package that is similar to NumPy, but with the added power of GPUs. It is also a deep learning framework that provides maximum flexibility and speed during implementing and building deep neural network architectures. Imperative Programming: PyTorch performs computations as it goes through each line of the written code. This is quite similar to how a Python program is executed. This concept is called imperative programming. The biggest advantage of this feature is that your code and programming logic can be debugged on the fly. Dynamic Computation Graphing: PyTorch is referred to as a “defined by run” framework, which means that the computational graph structure (of a neural network architecture) is generated during run time. The main advantage of this property is that it provides a flexible and programmatic runtime interface that facilitates the construction and modification of systems by connecting operations. In PyTorch, a new computational graph is defined at each forward pass. This is in stark contrast to TensorFlow which uses a static graph representation. PyTorch 1.0 comes with an important feature called torch.jit, a high-level compiler that allows the user to separate the models and code. It also supports efficient model optimization on custom hardware, such as GPUs or TPUs. Let’s understand PyTorch through a more practical lens. Learning theory is good, but it isn’t much use if you don’t put it into practice! A PyTorch implementation of a neural network looks exactly like a NumPy implementation. The goal of this section is to showcase the equivalent nature of PyTorch and NumPy. For this purpose, let’s create a simple three-layered network having 5 nodes in the input layer, 3 in the hidden layer, and 1 in the output layer. We will use only one training example with one row which has five features and one target. The first step is to do parameter initialization. Here, the weights and bias parameters for each layer are initialized as the tensor variables. Tensors are the base data structures of PyTorch which are used for building different types of neural networks. They can be considered as the generalization of arrays and matrices; in other words, tensors are N-dimensional matrices. Let’s see each of these steps in a bit more detail. Forward Propagation: In this step, activations are calculated at every layer using the two steps shown below. These activations flow in the forward direction from the input layer to the output layer in order to generate the final output. The following code blocks show how we can write these steps in PyTorch. Notice that most of the functions, such as exponential and matrix multiplication, are similar to the ones in NumPy. Loss Computation: In this step, the error (also called loss) is calculated in the output layer. A simple loss function can tell the difference between the actual value and the predicted value. Later, we will look at different loss functions available in PyTorch. Backpropagation: The aim of this step is to minimize the error in the output layer by making marginal changes in the bias and the weights. These marginal changes are computed using the derivatives of the error term. Based on the Calculus principle of the Chain rule, the delta changes are back passed to hidden layers where corresponding changes in their weights and bias are made. This leads to an adjustment in the weights and bias until the error is minimized. Updating the Parameters: Finally, the weights and bias are updated using the delta changes received from the above backpropagation step. Finally, when these steps are executed for a number of epochs with a large number of training examples, the loss is reduced to a minimum value. The final weight and bias values are obtained which can then be used to make predictions on the unseen data. In the previous section, we saw a simple use case of PyTorch for writing a neural network from scratch. In this section, we will use different utility packages provided within PyTorch (nn, autograd, optim, torchvision, torchtext, etc.) to build and train neural networks. Neural networks can be defined and managed easily using these packages. In our use case, we will create a Multi-Layered Perceptron (MLP) network for building a handwritten digit classifier. We will make use of the MNIST dataset included in the torchvision package. The first step, as with any project you’ll work on, is data preprocessing. We need to transform the raw dataset into tensors and normalize them in a fixed range. The torchvision package provides a utility called transforms which can be used to combine different transformations together. The values 0.5 and 0.5 represent the mean and standard deviation for 3 channels: red, green, and blue. Another excellent utility of PyTorch is DataLoader iterators which provide the ability to batch, shuffle and load the data in parallel using multiprocessing workers. For the purpose of evaluating our model, we will partition our data into training and validation sets. The neural network architectures in PyTorch can be defined in a class which inherits the properties from the base class from nn package called Module. This inheritance from the nn.Module class allows us to implement, access, and call a number of methods easily. We can define all the layers inside the constructor of the class, and the forward propagation steps inside the forward function. We will define a network with the following layer configurations: [784, 128,10]. This configuration represents the 784 nodes (28*28 pixels) in the input layer, 128 in the hidden layer, and 10 in the output layer. Inside the forward function, we will use the sigmoid activation function in the hidden layer (which can be accessed from the nn module). We are now ready to train the model. The core steps will remain the same as we saw earlier: Forward Propagation, Loss Computation, Backpropagation, and updating the parameters. Once the model is trained, make the predictions on the validation data. Let’s take things up a notch. In this use case, we will create convolutional neural network (CNN) architectures in PyTorch. We will perform object image classification using the popular CIFAR-10 dataset. This dataset is also included in the torchvision package. The entire procedure to define and train the model will remain the same as the previous use case, except the introduction of additional layers in the network. We will create the architecture with three convolutional layers for low-level feature extraction, three pooling layers for maximum information extraction, and two linear layers for linear classification. Once the model is trained, we can generate predictions on the validation set. We’ll pivot from computer vision use cases to natural language processing. The idea is to showcase the utility of PyTorch in a variety of domains. In this section, we’ll leverage PyTorch for text classification tasks using RNN (Recurrent Neural Networks) and LSTM (Long Short Term Memory) layers. First, we will load a dataset containing two fields — text and target. The target contains two classes, class1 and class2, and our task is to classify each text into one of these classes. I highly recommend setting seeds before getting into the heavy coding. This ensures that the results you will see are the same as mine – a very useful (and helpful) feature when learning new concepts. In the preprocessing step, convert the text data into a padded sequence of tokens so that it can be passed into embedding layers. I will use the utilities provided in the Keras package, but the same can be done using the torchtext package as well. Next, we need to convert the tokens into vectors. I will use pretrained GloVe word embeddings for this purpose. We will load these word embeddings and create an embedding matrix containing the word vector for every word in the vocabulary. Low-level feature extraction from both the input images. This can be done using pretrained deep learning models such as VGG19. Load the two images on the device and obtain the features from VGG. Also, apply the transformations: resize to tensor, and normalization of values. Now, we need to obtain the relevant features of the two images. From the first image, we need to extract features related to the context or the objects present. From the second image, we need to extract features related to styles and textures. Object Related Features: In the original paper, the authors have suggested that more valuable information about objects and context can be extracted from the initial layers of the network. This is because in the higher layers, the information space becomes more complex and detailed pixel information is lost. Style Related Features: In order to obtain the texture information from the second image, the authors used correlations between different features in different layers. This is explained in detail in point 4 below. For object information extraction, Conv42 was the layer of interest. It’s present in the 4th convolutional block with a depth of 512. 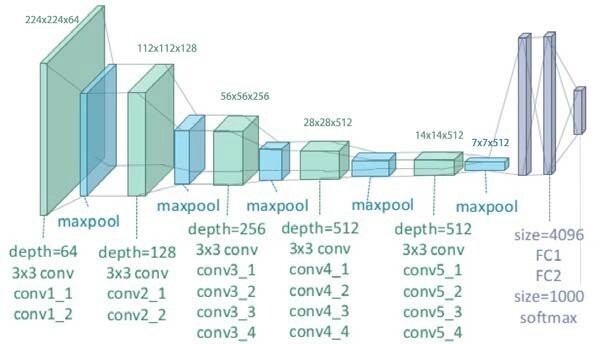 For style representation, the layers of interest were the first convolutional layer of every convolutional block in the network, i.e., conv11, conv21, conv31, conv41, and conv51. These layers were selected purely based on the author’s experiments and I am only replicating their results in this article. As mentioned in the previous point, the authors used correlations in different layers to obtain the style related features. These feature correlations are given by the Gram matrix G, where every cell (i, j) in G is the inner product between the vectorised feature maps i and j in a layer. 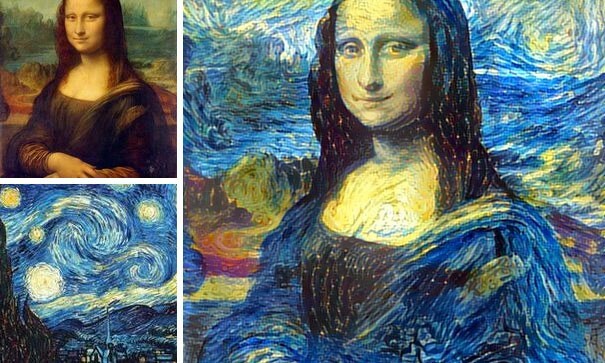 We can finally perform style transfer using these features and correlations,. Now in order to transfer the style from one image to the other, we need to set the weight of every layer used to obtain style features. As mentioned above, the initial layers provide more information so we’ll set more weight for these layers. Also, define the optimizer function and the target image which will be the copy of image1. Start the loss minimization process in which we run the loop for a large number of steps and calculate the loss related to object feature extraction and style feature extraction. Using the minimized loss, the network parameters are updated which further updates the target image. After some iterations, the updated image will be generated. In the end, we can view the predicted results. I ran it for only a small number of iterations, but one can run up to 3000 iterations (if computation resources are no bar!). There are plenty of other use cases where PyTorch can, and has been used. It has quickly become the darling of researchers around the globe. The majority of the open source libraries and developments you’ll see happening nowadays have a PyTorch implementation available on GitHub. In this article, I have illustrated what PyTorch is and how you can get started with implementing it in different use cases. One should treat this guide as the starting point. The performance in every use case can be improved with more data, more fine-tuning of network parameters, and most importantly, applying creative skills while building network architectures. Thanks for reading and do leave your feedback in the comments section below. Build your First Image Classification Model in just 10 Minutes!